Any opinions on arrow weight for hunting? I’m kinda lost on this subject. The arrows I have are 320gr and the broadheads I picked up are the same at as my target tips (110 I think) but should I go heavier? Don't be so concerned with total arrow weight. As long as you are shooting properly spined arrows for your setup that shoot accurately out of your bow. Put the arrow where it counts and it will do its job. I like having my arrows in the mid 400's. Just make sure your FOC is good to go. I do the calculations because I want the best chance at success and ethical kills but I dont think its that big of concern most of the time. As mentioned by Hogie & Moose, make sure your arrows are proper spine for your draw length and weight. Once that choice is made, then practice. More than likely, you'll have less issues with properly spined arrows than worrying about the overall weight. That being said, I'm shooting slightly heavier arrows than what I've shot in the past as a "just in case" scenario.... Heavier arrows will quiet down your shot at the moment of release and carry extra momentum at point of impact. While heavier arrows affect trajectory and pin gap, with practice anyone can shoot the heaviest of arrows with all the confidence needed. As an example, I've always shot 70#, 29.5" length. Tried going super light (380 grains) years ago and had success while hunting (all pass throughs except when hitting large bones like a shoulder socket). After talking to some pro shops, decided to up the weight to my current 550 grains and have blown through everything I've been lucky enough to release on. Going up in weight has significantly helped quiet down my bow at the moment of release. While my current setup won't blow through everything in every situation, it's giving me the best opportunity to do so. I think I would have an issue with a BIG bull Moose's shoulder blades straight on - might punch through one side but I'm not sure about going through the offside (haven't had the chance to test this theory, and hopefully will perform a better shot than this if given the chance). Just make sure the arrows are spined correctly and shoot straight coming out of your bow. What's your DL and #? 110grn seems odd for point weight usually be 100, 125 or 150grn. Either way your coming out over 400grn so I'd say your fine. Never plan on being able to shoot through a moose or elk shoulder blade first off, that's a poor shot placement. Secondly there are too many factors at play to be able to do that. Including where on the shoulder blade you hit. I like 400gr minimum arrow weight, I have 78-79KE I made a poor shot on an elk this year with my first shot and at 15 yards (quartering away from above) I didn't get through the shoulder blade. I have had complete pass through a on 5 other elk and my second shot was a passthrough too. I was able to stop him at 40 and put one where it counts. Now I have a cool memento to my hunt and a reminder to make sure everything is set correctly before I take a shot. Last edited by Lefty-Canuck; 10-12-2017 at 08:14 AM. I shoot a 538 grain arrow @ 285 fps out of an 80lb bow with a fixed blade broad head. This gives me 97 pounds of kinetic energy. I am able to shoot this setup all day long and after sitting in -30C for hours on end and I can do it accurately. I have shot many 3D shoots with this setup as I don't have a 3D setup and have done well. I start with this statement because I feel that the most important part is being able to shoot your setup under all conditions accurately and with confidence. I have chosen my setup for the worst case scenario where the shot may not be the best placed shot or it might have hit a large bone. With this setup a complete pass through on a bull elk at 50 yards is not a problem. 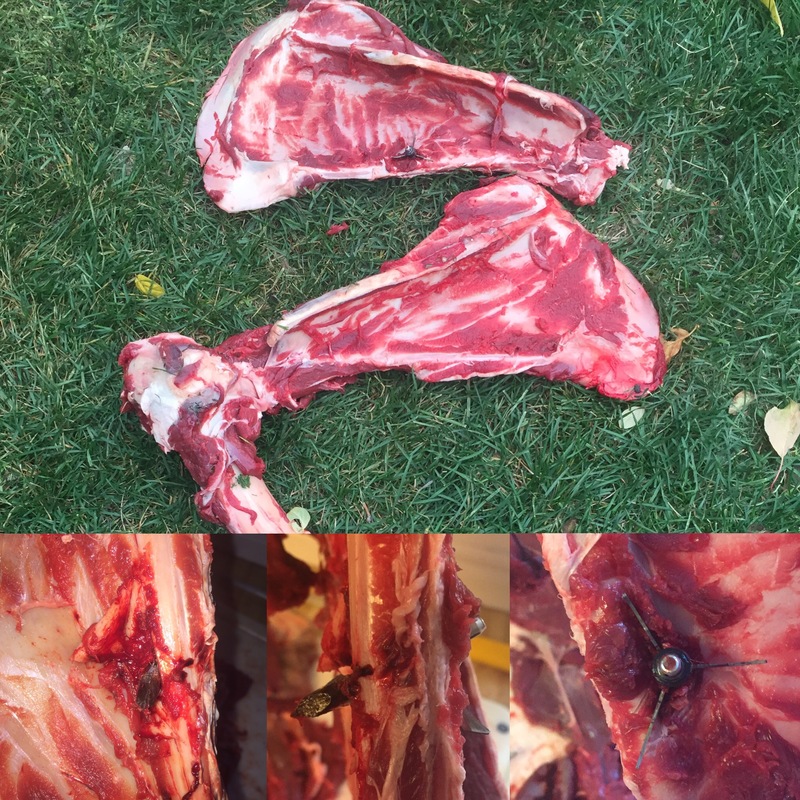 I have also found elk shoulder blades are not a problem but the joint where the leg connects to the shoulder blade is a problem. For me I put more value in hitting power than high speeds and a tight pin gap; but that is just me. I shoot a similar rig, 530 grains at 292 fps and it goes through just about everything I plan on hitting. Tune and broadheads choice are also very important but arrow weight plays a large part on potential and actual penetration. I've shot through the leg bone on a bull elk below the joint with 630 grains, it gave me enough penetration to get both lungs (he was bedded). In testing to get through the actual knuckle consistently (in testing) I had to use my 790 grain arrows with 150 grain vpa penetrator broadheads (the ones I used in Australia for water buff). 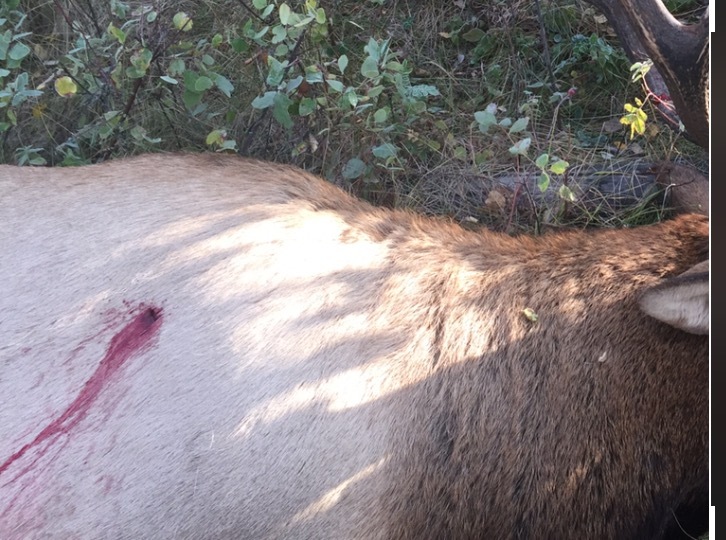 If we take lefties elk, lightweight arrows and big mechanical broadhead, low momentum and an irrelevant KE calculation leads to poor penetration on even the thin scapula. The only place a setup like that has any value is thin animals, perfect shots OR a bad shot to far back like liver or guts where a big cut may help you recover the animal. It's the last arrow I would want to take against bone or a quartering shot where I need 3' of penetration. The flip side is you probably won't get much penetration on a bad bone hit and the animal will probably live to be shot another day (unless you can get a second arrow in him). OP you'll have to pick your poison, if your hampered by shooting low draw weight or short draw length you might want to keep the weight moderate to help with trajectory. By moderate I'm talking 450ish, for my money I'll stick with 500-550 as an all around arrow and go heavier when I start shooting bigger animals. Up to this point I have had pass throughs on likely 95% of my animals, usually due to hunting at reasonable ranges and good shot placement. The momentum I achieve is 0.53-0.54 roughly. The setup I have has served me well when I do my part. The area I was unlucky enough to hit is the second worst part of the scapula. 2" up and I likely would have punched through. It was a quartering away and caught that ridge square. No setup is perfect for all conditions, there is always a give or take balance. Last edited by Lefty-Canuck; 10-12-2017 at 03:13 PM. I am shooting 700gr at about 270 fps, 80 lb bow w a 32" DL. Momentum is .89 and KE is 118. I never shoot past 40 yds and like about 200grains up front. With this set up I feel I am prepared for bone. Lost a nice bull one time and this is my remedy I guess. Confidence in your gear and proper placement is always top 2. Great pics and info Lefty. Thanks for posting this! Grizzlystik arrows are junk, the ABS broadheads use junk steel as well. There are many great options for high foc and quality arrows/broadheads. I've still got some grizzlystik shafts if your around red deer and want to know why they're crap. Where do you find arrows with that many gpi? I shoot 300 spine arrows that run around 10gpi. I haven't found anything much heavier. Do you wrap your arrows to get the weight up?